"Valuing the Uniqueness in Each of Us." 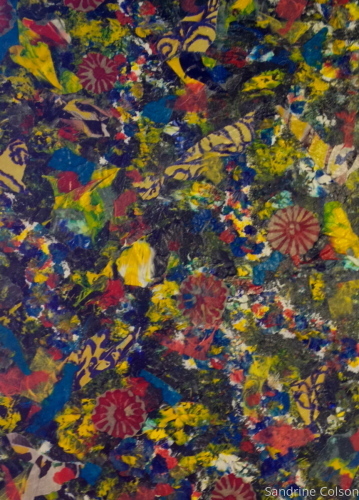 Mixed Media on wooden board: ink, paper fibers, paper collages, acrylic and enamel paint. Ready-to-hang - No framing required. 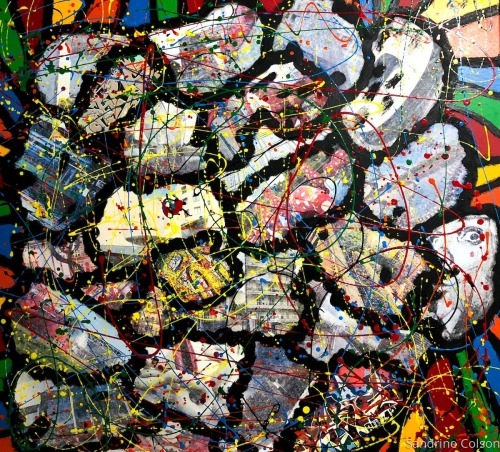 Mixed Media piece on canvas: acrylic, liquid acrylic and collages of Boston street graffiti art. Ready to hang - no framing required. 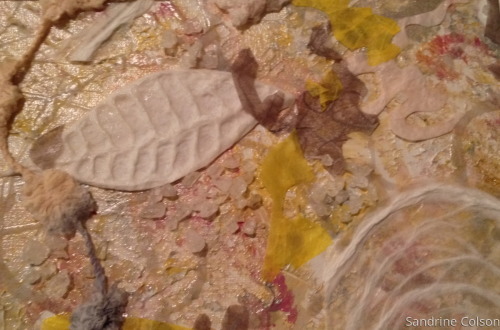 Mixed Media: acrylics, inks, paper collage, image transfers. 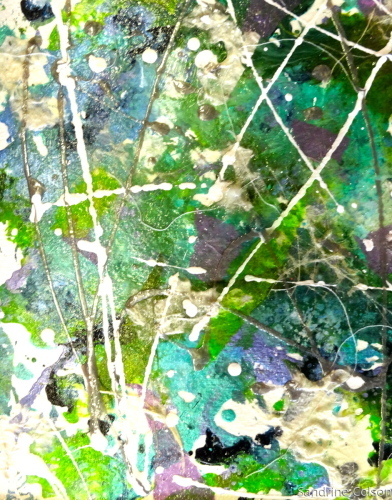 Mixed Media: paper, acrylic, inks. Fall representation. Unframed. 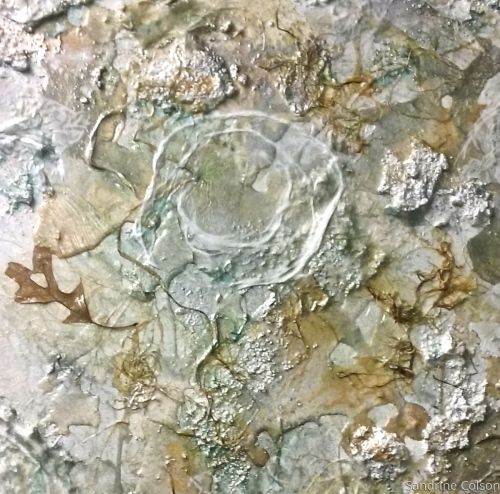 Mixed Media on wooden board: ink, sand, leaf, paper collages, wood paper fiber, silver powder, acrylic and enamel paint. Ready-to-hang - No framing required. 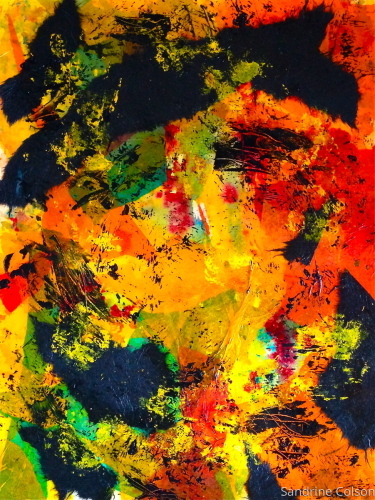 Mixed media on paper: hand made paper collages, other types of paper collage, inks, gel medium and acrylic paints. Unframed. 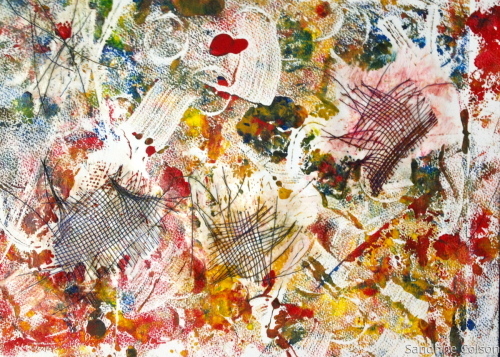 Mixed Media on paper mounted on a canvas board: inks, charcoal, cardboard and/or tissue paper. Ready-to-hang. 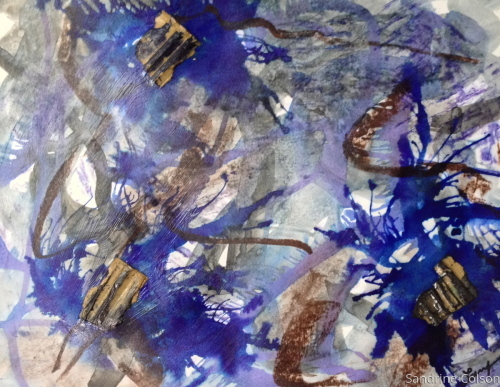 Mixed Media on paper: inks, charcoal, and cardboard. 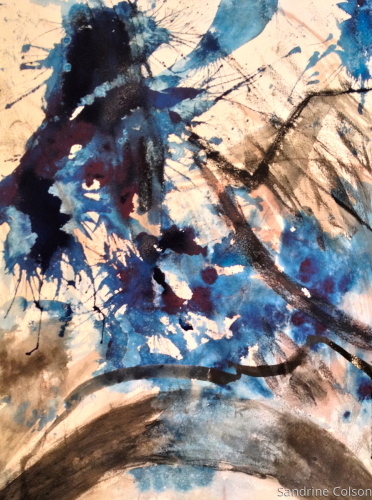 Mixed Media on paper: inks, charcoal and tissue paper. 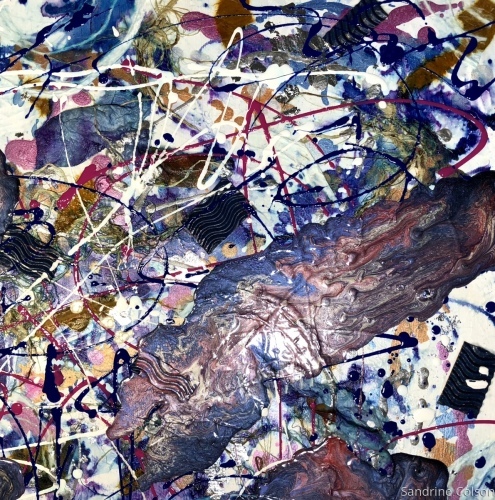 Mixed Media piece on paper: multi-color monoprint, acrylic, liquid acrylic, cardboard, and blue plastic woven pieces. Unframed. 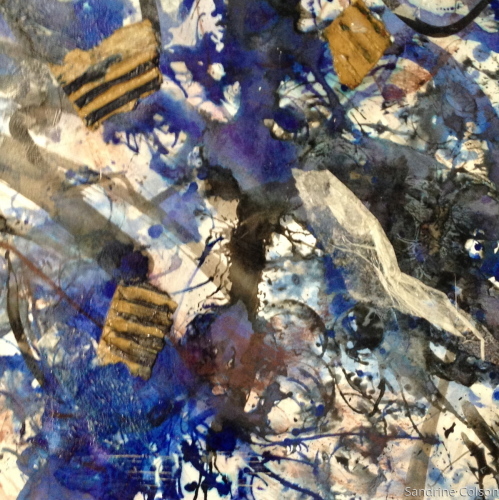 Mixed Media piece on paper: multi-color monoprint and blue plastic woven pieces. Unframed. 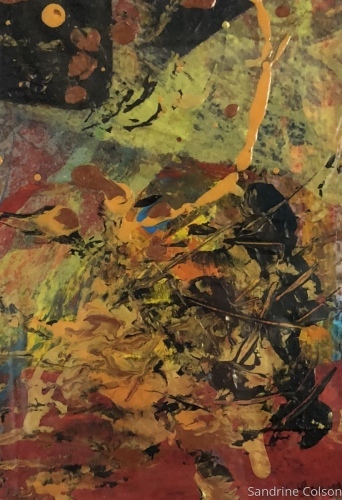 Mixed Media piece on canvas: acrylic, liquid acrylic, black oil stick, collage and transfer of contemporary Parisian architectural or sculptures or Paris street graffiti art images. Ready to hang - no framing required. “Contemporary Paris Kaboom” represents a Paris modern architectural fantasy. 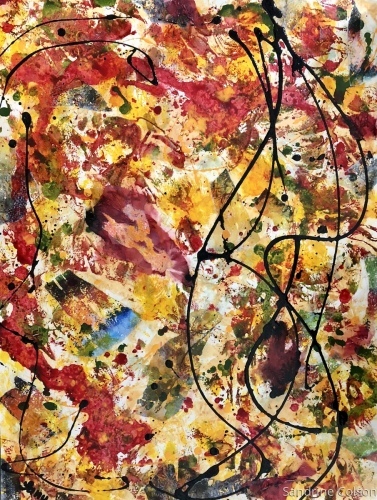 I started by transferring to the canvas picture images of modern buildings or landmark such at the Centre George Pompidou Museum or Beaubourg. Then added many other places such as the Museum of Contemporary Art, the Open Air Museum of Culture, Paris’ Art Street, other street buildings, etc. I also added some images of famous Paris wall Graffitis. I noticed that the images took the shape of organic objects and to emphasize this, I traced their contour with a black oil stick. As I did so, the piece started looking cartoon-like and I decided to highlight the mix of contemporary Parisian architectural images with bright acrylic colors bands contoured with the same black oil stick. The overall center object made of blurbs of contemporary buildings and graphic items made me think of a “kaboom” cartoon popping out of the canvas. In some ways, this piece represents a glimpse of a futuristic city where new super heroes could emerge to save the day. 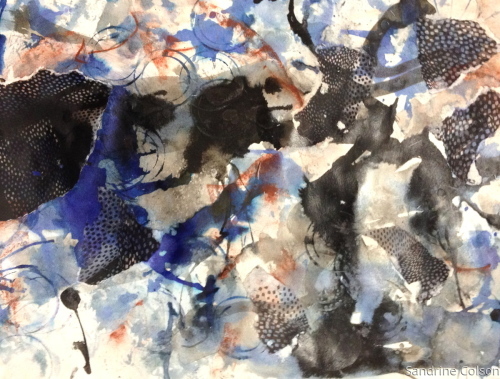 Mixed Media piece on paper: inks, stamps, image transfers, tissue paper and charcoal. Framed. 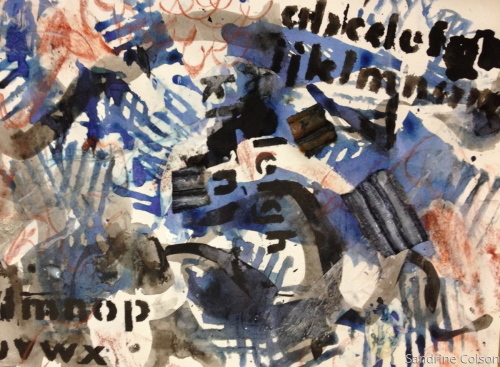 Mixed Media on paper: letter and cardboard stamps, cardboard collages, charcoal and inks. Framed. 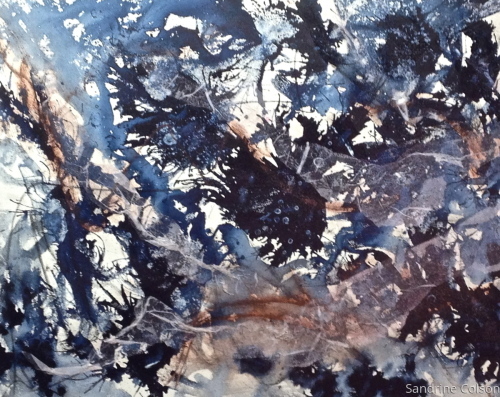 Mixed Media piece on canvas: inks, charcoal and tissue paper. Ready to hang - no framing required. 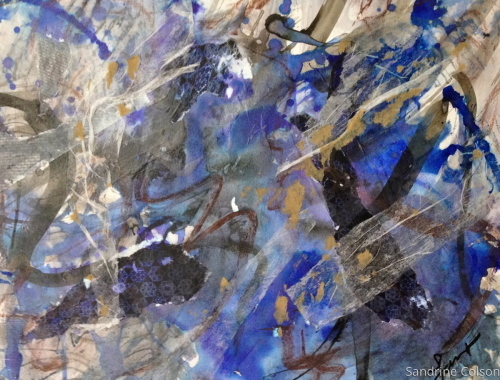 Mixed Media on canvas: inks, charcoal and tissue paper. Ready to hang - no framing required. 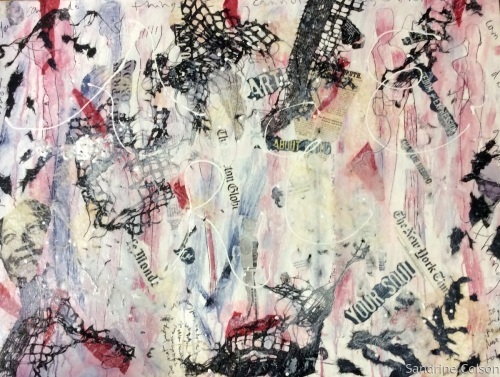 Mixed Media piece on canvas: acrylic paint, paper, collage or image transfer of various images, marker writing or written quotes by famous Americans in Paris: Hemingway, Henry James, Oscar Wilde, Buchwald, etc. Includes images by Sargent and Cassatt and of Josephine Baker, as well as some Paris landmarks. Ready to hang - no framing required. “We’ll Always Have Paris” represents a journey to the past within Paris history and the famous Americans who love it. This piece includes Fitzgerald, Hemingway, Henry James, Mary Cassatt, Art Buchwald, Josephine Baker, Orson Wells, Ben Franklin, and more. Writings by many of these people and others are finishing the piece. I first painted a background of orange, pink, black and white acrylic patches then toned them down with washes of white acrylic paint to give a mysterious and distant feeling as if they were faded by time. I also transferred picture images of the various famous people mentioned earlier in various settings and a couple of places they liked to spend time at such as the Moulin Rouge or the Eiffel Tower. I did a final wash with the white acrylic paint to give a fading effect to the whole in view of representing these items as memories of the past rather than being in the present. 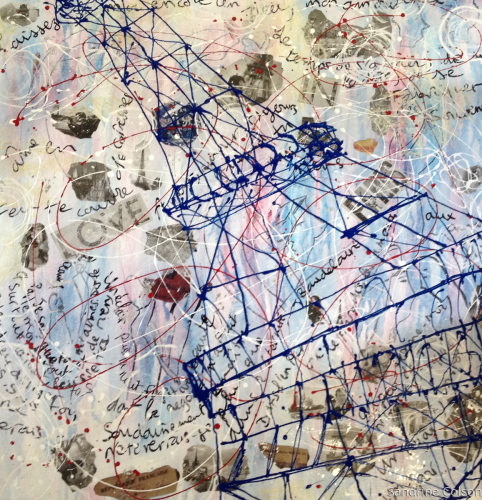 Many of the people represented on this piece are writers, thus, their quotes about Paris as well as the ones of other thinkers, artists or writers are shown on the surface of the whole piece. Finally to finalize this work on the “Americans in Paris”, the famous “We’ll always have Paris” by Howard Koch (screenwriter in the movie “Casablanca”) conclude the piece in large cursive liquid white acrylic letters. 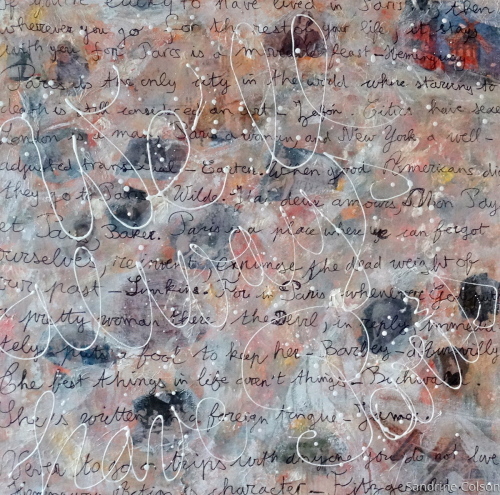 Mixed Media piece on canvas: acrylic paint, handmade paper, collage of various images, marker drawings of lovers, written parts of french songs by Edith Piaf and poetry by Aragon, Victor Hugo and more. Ready to hang - no framing required. 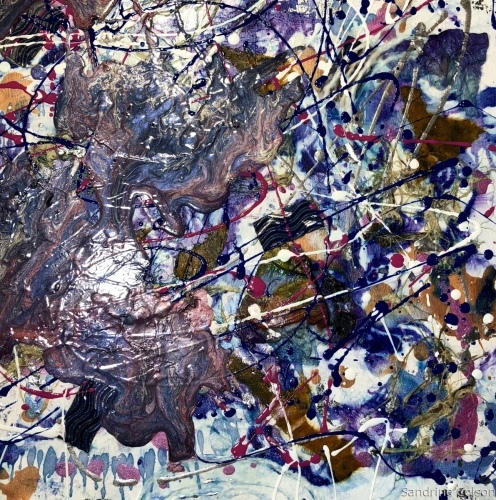 “Blue Love in Paris” represents the quintessence of what Paris represents to most of us: the city of love. 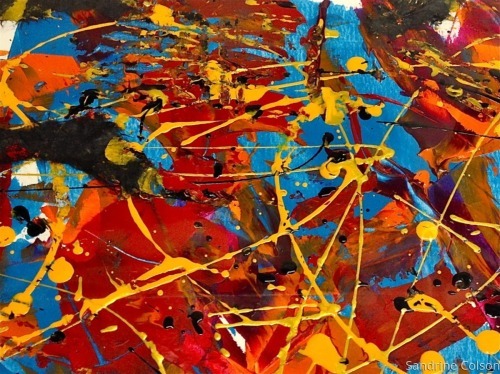 This piece is a story of love where one meets its soul mate under the romantic sky of Paris where so many lovers met and where so many poets and song writers wrote about love hopes or broken hearts. This a story of Paris as the city of romance. 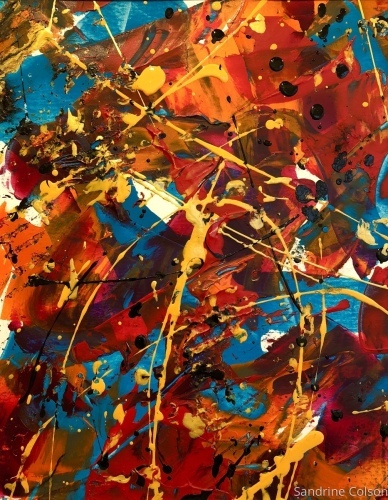 I started this piece with a wash and drips of blue, red, and white acrylic paints, the colors of the French flag. I added image transfers of various printed pictures representing lovers throughout the modern ages (60’s, 70’s, etc). I also added some collages of some items I felt represented Paris or France. Then while looking at the piece I recognized shapes of lovers or people meeting and started to draw them. Each with their own story to unveil. Then, I added various sentences from songs such as Edith Piaf, poetry, sayings or writings from Aragon and others. I added the printed words “Love in Paris” with pictures of Paris monuments under the letters. These words were separated throughout the piece as the love stories in this piece are ongoing and not final. 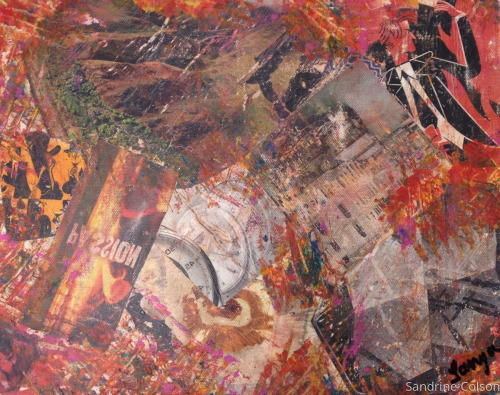 I also added some twirly or circular pieces of white paper collages to give a sense of whirlwind as love can make one feel lost in an emotional happiness twirl. I then drew a schematic representation of the Eiffel Tower, symbol of Paris and where lovers meet the most for their rendez-vous. 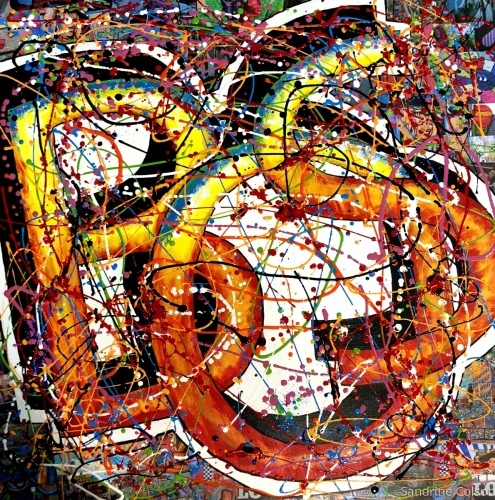 Finally, to enhance the madness where love can take us, I drew liquid acrylic twirls and circles in blue, white and red. This is an emotional piece for me because Paris is where I met the father of my two amazing daughters. 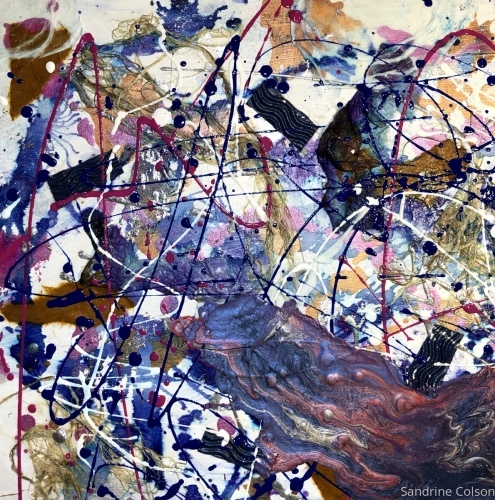 “Bronze Award" - Art Forward Contest 2 - For "Blue Love in Paris", mixed media. 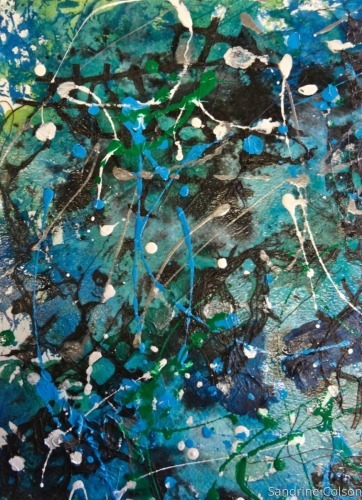 Mixed Media on canvas: acrylic paints, tissue paper collages, handmade paper collage, picture collages, written words or sentences, newspaper collage, marker drawings, and liquid acrylic paint. 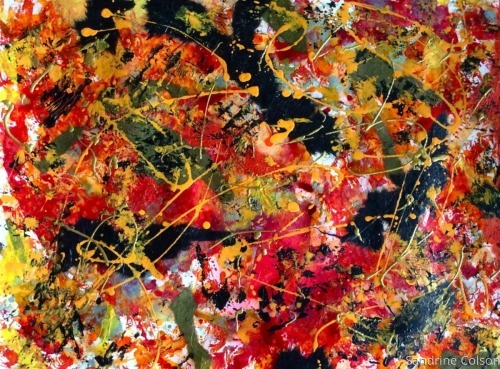 “Expressing Rightness” is inspired from the terrorist acts in Paris. 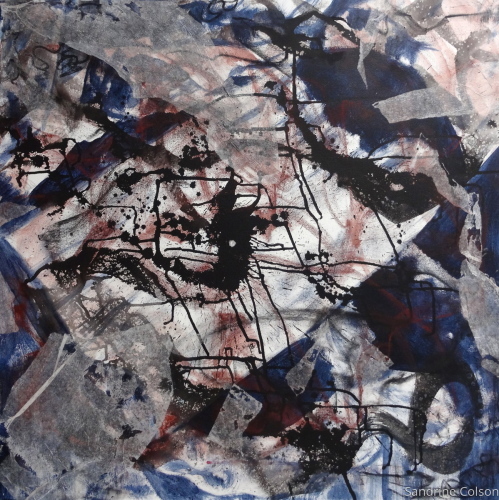 Following these terrible events: attack on Charlie Hebdo in January 2015 and the Bataclan concert Hall during the Spring of the same year, I created this work. I did not realize how these events affected me until I started this piece. 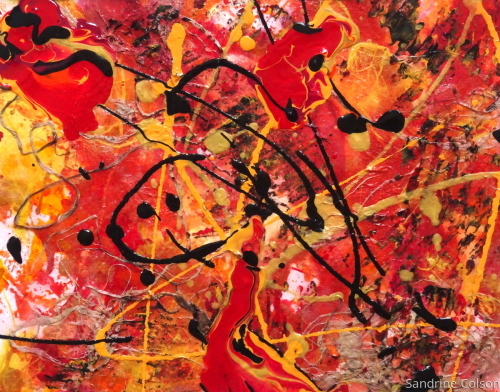 As a starting point, I used drips of white, red and black acrylic paints. 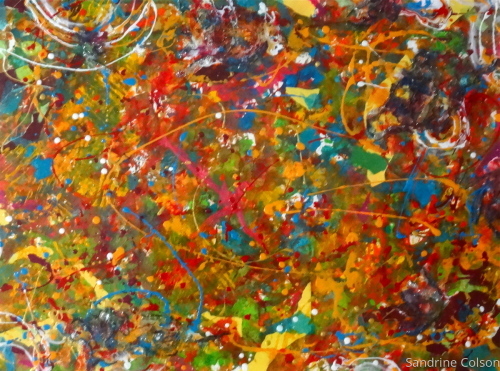 My initial intent with this piece was to represent freedom of speech and each color symbolized this. White represents the paper onto which the writing of freedom is done; black the ink; red the blood of martyrs that suffered or died to express freedom. Once the drips were completed. I noticed forms and shapes. I drew these forms more explicitly. Most of these forms represented people, the ghosts or unknown defenders of justice. A paint brush and the broken pencil of Charlie hebdo appeared as well. Then, I glued paper images of some famous defenders of rights or justice: Martin Luther king, Nelson Mandela, and mother Theresa. I wrote quotes from various thinkers about justice or injustice. I glued parts of newspapers from all over the world as symbols of freedom of speech and the right to express what’s just. I glued ripped pieces of paper grids to represent the oppression and prisons that many of the defenders of justice had to face because of what they said and where able to free themselves from. I also glued pieces of red paper to represent the intensity these people suffered leading eventually for some to their death. 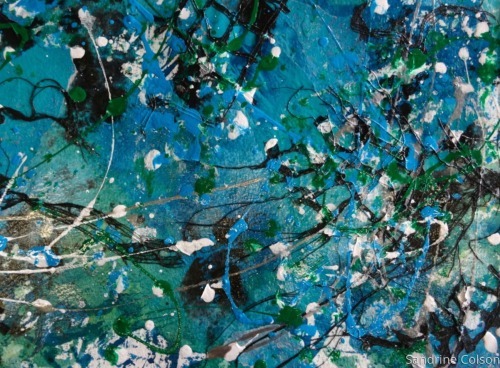 My piece then ended up being more about expressing what’s right rather than defending a right - freedom of speech - thus its title “Expressing Rightness.” Art is a a mean of expressing justice, and what’s right, as art is a representation of the soul. 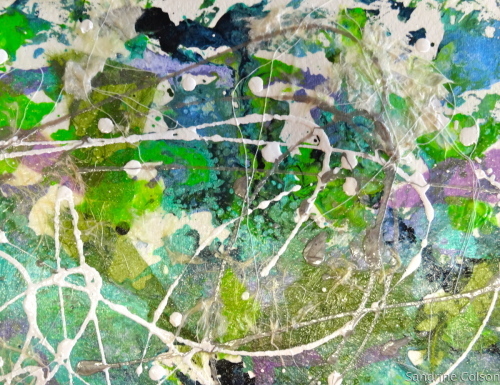 Mixed Media on paper: inks, handmade paper collage, and liquid acrylic paint. Matted but unframed. 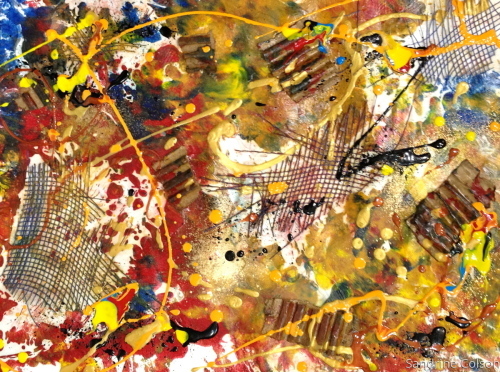 Image is 7.5-8.5" x 8.5-9.5"
Mixed Media on paper: acrylic, ink, paper, image transfers. Unframed. 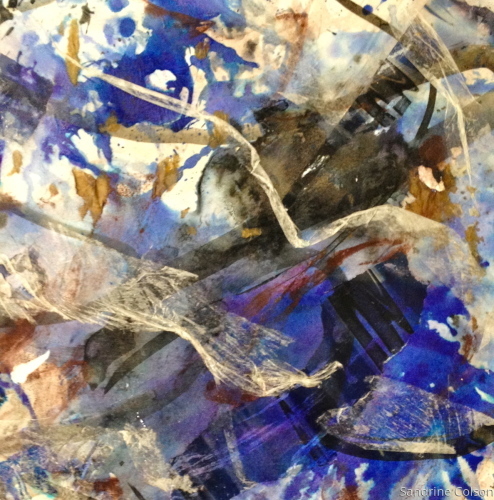 Mixed Media on paper: inks, handmade paper collage, and liquid acrylic paint. Matted but unframed. 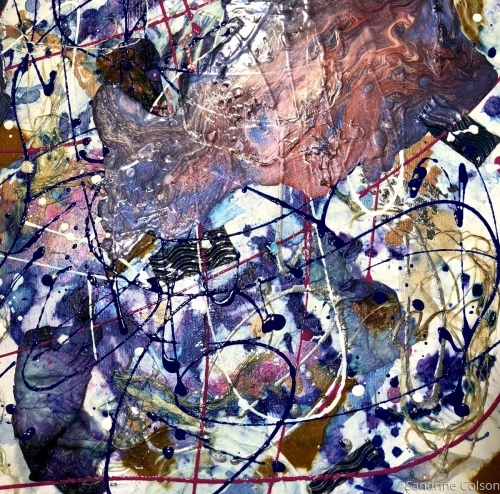 Image is 7.5" x 8.5-9.5"
Mixed Media on paper: inks, handmade paper collage, and liquid acrylic paint. Matted but unframed. 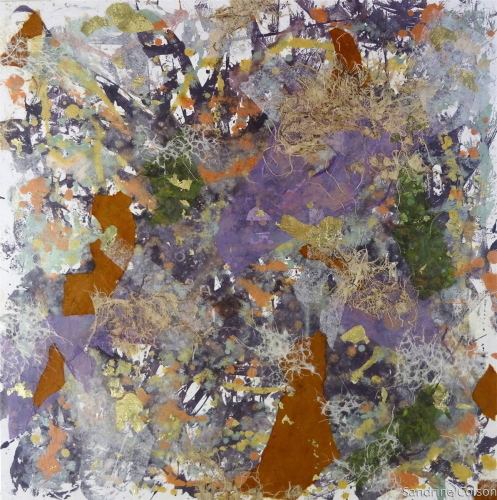 Image is 8.5-9.5" x 7.5-8.5"
Mixed Media on canvas: inks, tissue paper collages, handmade paper collages, and gold leaves. Ready-to-hang - No Framing required. 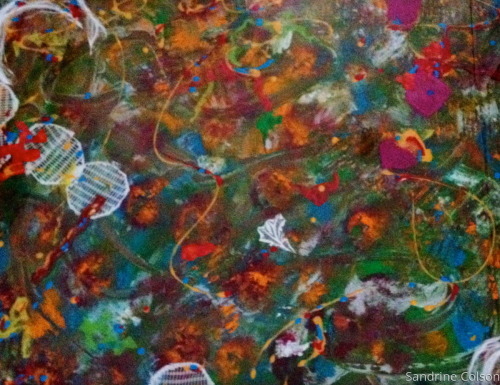 Mixed media on canvas paper: hand made paper collages, other types of paper collage, gel medium and acrylic paints. Framed. 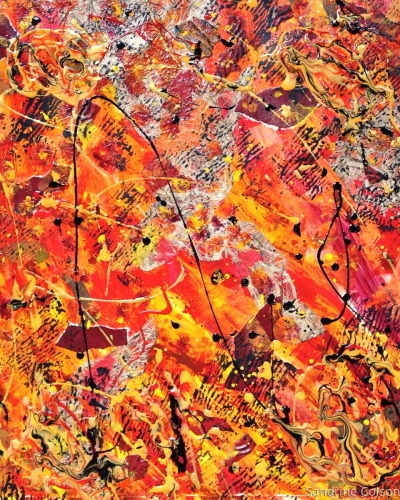 For me the story in this piece is based on Fall. 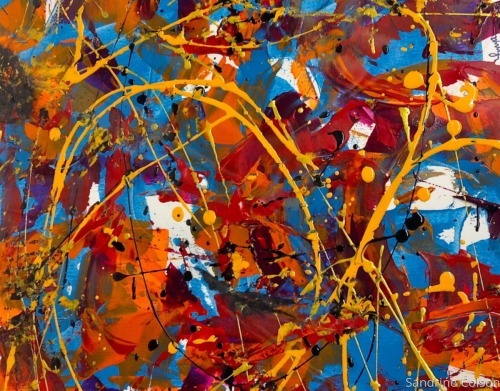 Twirly leaves fall towards the center of the piece in an intense dance of colors while a gentle genie is managing the motion so all goes well. 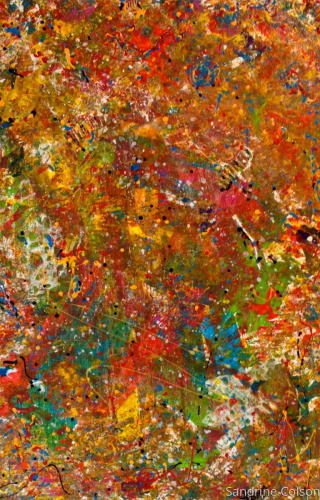 It is a story of colors and transition. 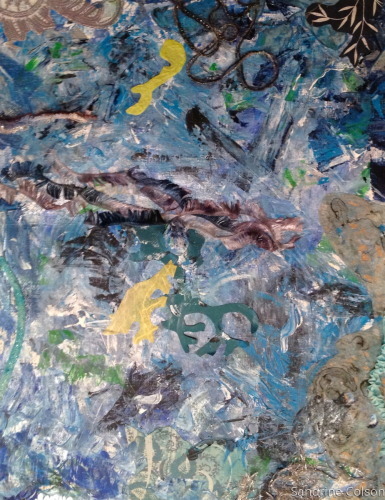 Mixed Media on paper: Acrylic, Paper. Unframed. 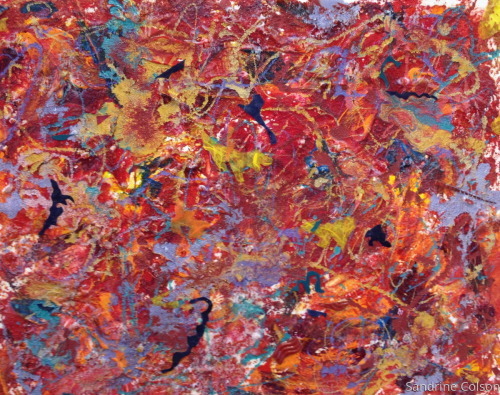 Inspired by the colors of various festivities fireworks. 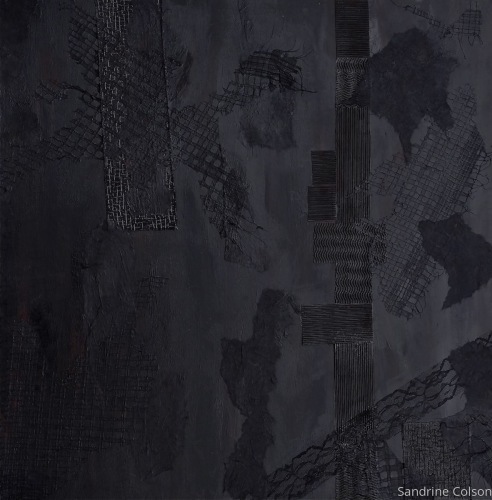 Mixed Media on canvas: acrylic paints, handmade paper collage, fabrics, and cardboard collages. Ready-to-hang - no framing required. 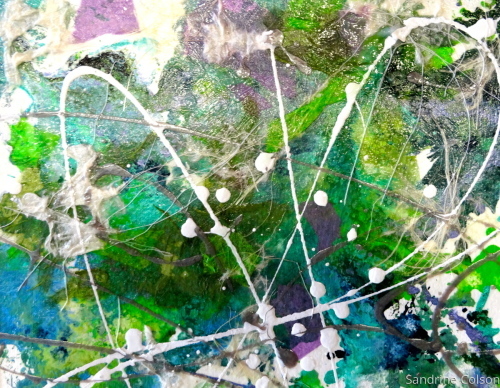 Mixed media on canvas paper: hand made papers, other types of paper, yarn, gel medium and acrylic. Framed. 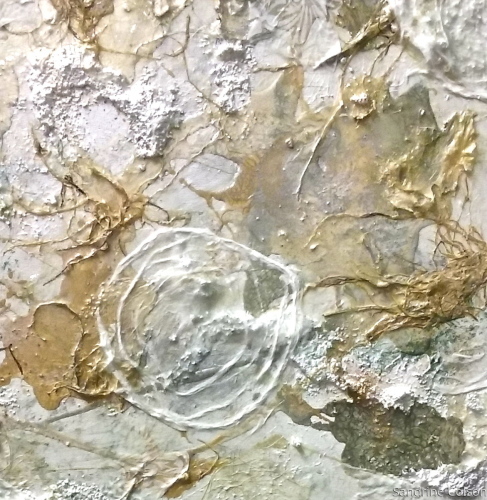 Mixed media on canvas: hand made papers, magazines, recycled silk paper, gel medium and acrylic. Framed. 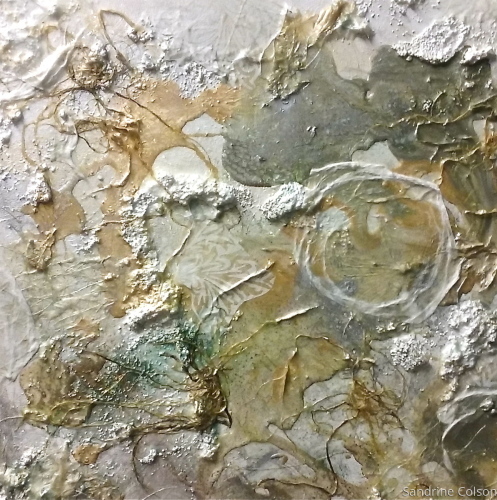 Mixed media on canvas paper: hand made papers, paper fibers, other papers, acrylics, liquid acrylics, Pebeo prism moon paints, gel medium and acrylic. Framed. 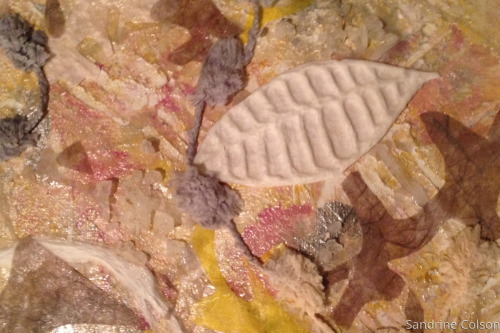 Mixed media on canvas paper: hand made papers, paper fibers, other papers, painted cardboard, gel medium and acrylic. 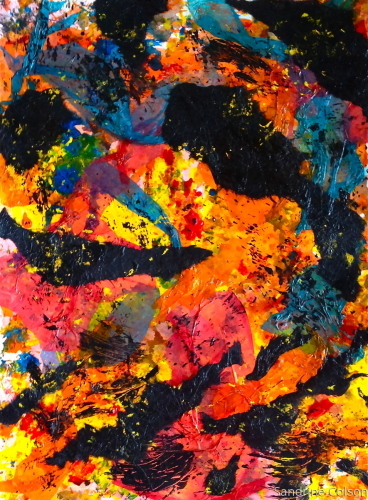 Image is 14" x 18". Framed. 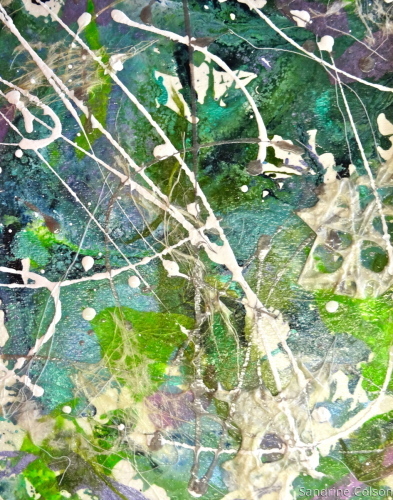 Mixed media on canvas paper: various style papers, transfers, painted cardboard, gel medium and acrylic. 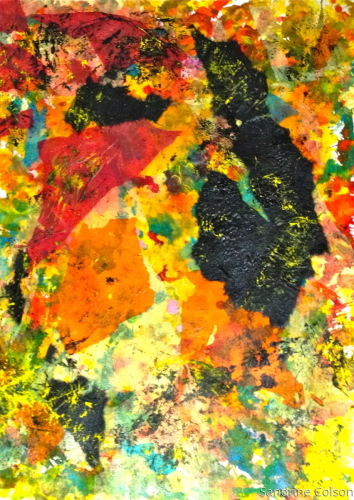 Image is 16" x 20". Framed. 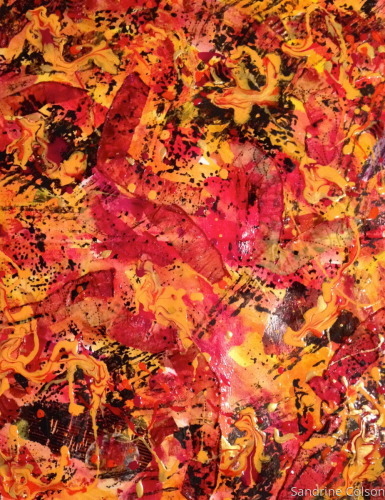 Mixed media on canvas board: paper collage, acrylic, liquid gloss acrylic, and sand. Framed. 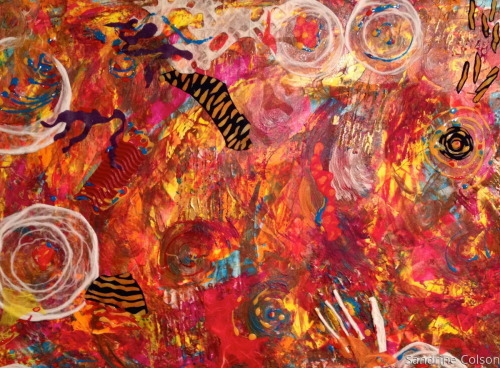 Mixed Media: acrylic, collage and paper transfer on canvas board. The overall work is finished with satin gloss. Framed. 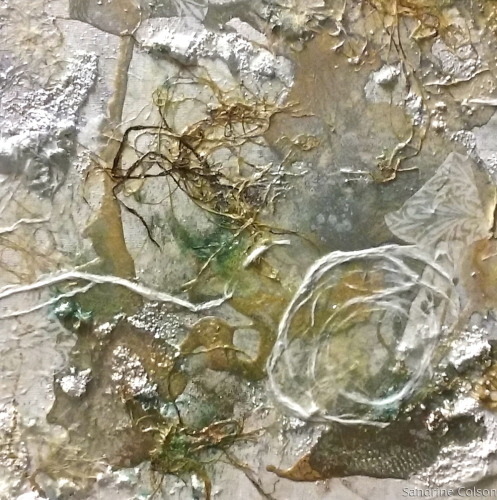 Mixed Media on canvas: acrylic, paper transfer and collage. Ready-to-hang - no framing required. 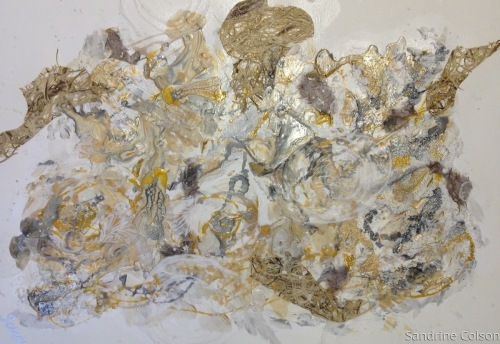 Mixed media on canvas sheet: acrylic, enamel paints, salt, sand, satin varnish and paper collage. Image size is 16" x 20". Framed. 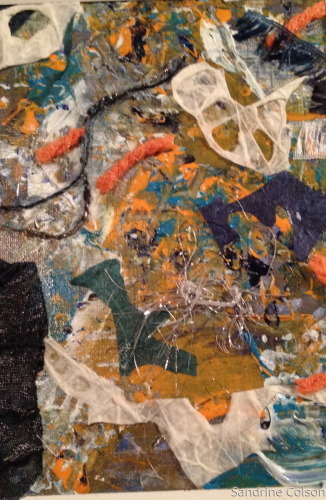 Mixed media: acrylics, fabrics, yarns, paper collage on canvas paper. 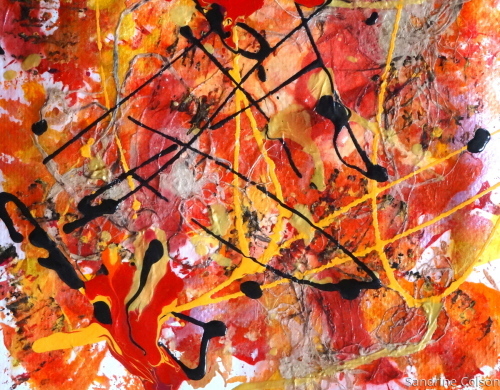 Image is 5" x 7". Framed. 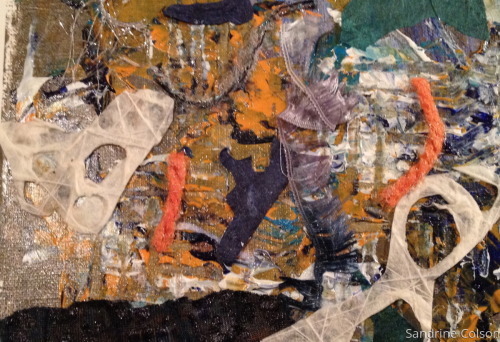 Mixed media: acrylics, fabrics, yarns, paper collage on canvas paper. 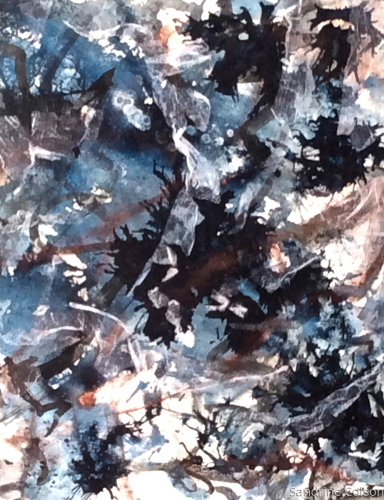 Image is 7" x 5". Framed. 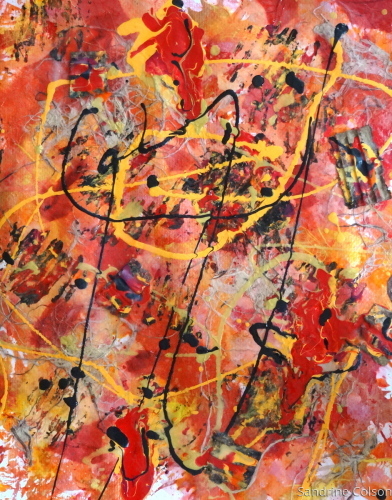 Mixed Media on glass. Framed. Mixed Media on paper: acrylic paints, fabric, paper collage. Framed. 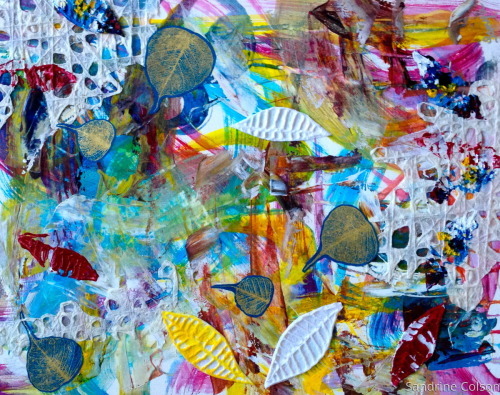 Mixed Media: acrylic paint, fabric, yarn, paper. Framed. 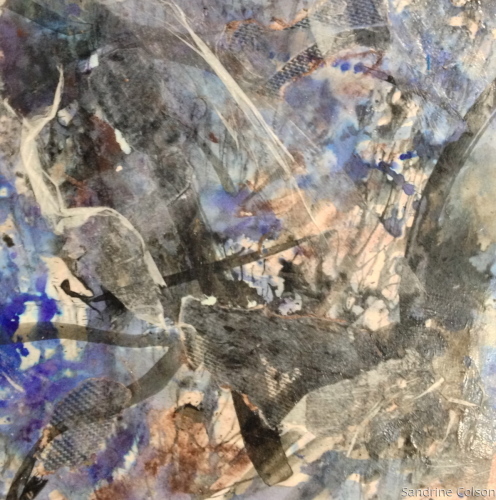 Mixed Media - Acrylic paint and collage on paper. Framed. 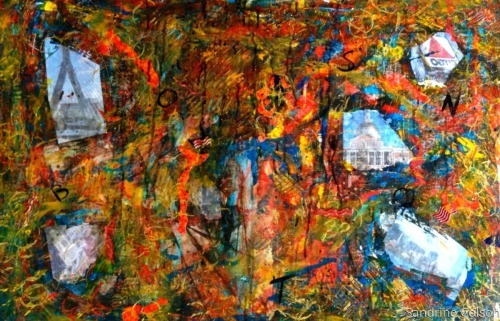 Mixed Media: acrylic, paper, collage and images transfer. 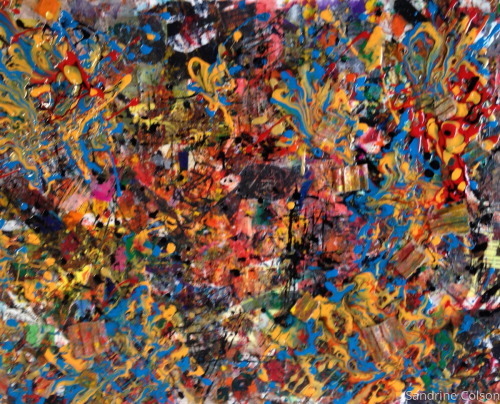 Abstract representation with Boston Pictures. Framed. 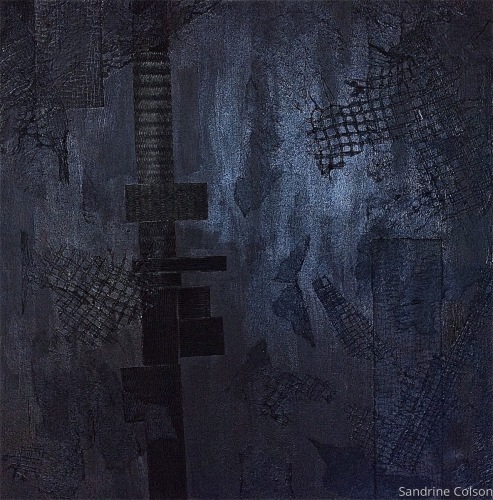 Mixed Media - Acrylic and paper collages. 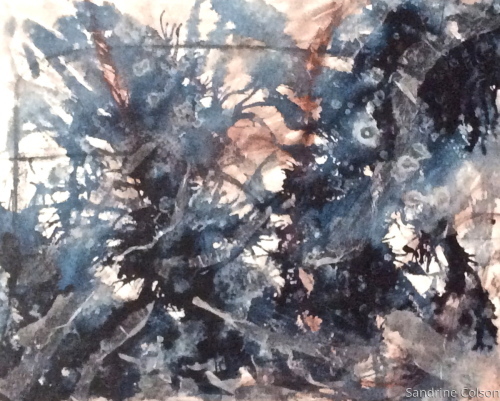 Image is 7"x 5"